^ “Cinnamon”. Encyclopædia Britannica. (2008). "(species Cinnamomum zeylanicum), bushy evergreen tree of the laurel family (Lauraceae) native to Bangladesh, Sri Lanka (Ceylon), the neighboring Malabar coast of India, and Myanmar (Burma), and also cultivated in South America and the West Indies for the spice consisting of its dried inner bark. The bark is widely used as a spice due to its distinct odor." Mathew, Sindhu; Abraham, Emilia (March 2006). 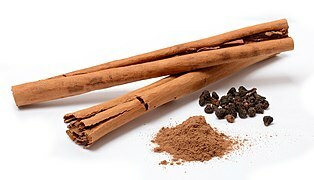 “Studies on the antioxidant activities of cinnamon (Cinnamomum verum) bark extracts, through various in vitro models”. Food Chemistry 94 (4): 520. doi:10.1016/j.foodchem.2004.11.043.